09:04 red-001 set run_in_place to one? 09:41 Foghrye4__ Hello everybody! Since when 3d person view was disabled in Minetest? And why? 09:58 Foghrye4__ Yep, F1-F12 are not working. Thank for advice. 10:17 Foghrye4 A friggin "office" buttton! 10:20 Guest53631 shadow: [23:46:43] <shadow> is there an oldest continuously running minetest world? 10:21 Guest53631 [00:39:18] <kruug> sfan5: I issued /emergeblocks but I'm not getting a progress counter. Thoughts? 10:21 Guest53631 what does emergeblocks do? 10:21 sfan5 the build i compiled was 0.4.14, do you want a dev build? 10:26 Guest53631 sfan5: what does emergeblocks do? 10:27 Megaf sfan5: the whole thing? 10:27 Megaf all 64Km squared? 10:29 sfan5 kruug: maybe the progress counter is a recent change; the build I compiled was 0.4.14, do you want a dev build? 11:19 agaran Krock: do you know which mod contained stone ladders? looking like footsteps engraved/cut in stone? 11:30 agaran I must remind where I saw it..
11:31 agaran no, I am sure it was not, I'll find it..
11:51 red-002 how do you kill a ghost nick? 13:45 agaran Krock: I am right you build few things there recently and updated sign? 13:47 agaran well 'normal people' then? 13:53 agaran Telesight: why on/off switch on your server for technic machines? 13:55 agaran ah, so you turn them off to save on abm's? 14:00 Telesight And the cars then ? 14:06 agaran sounds like need to wear hardhat..
14:21 Telesight @agaran More questions ...? 15:03 agaran Telesight: well I'll wander more and if I decide to stay there a bit I'll ask for interact when I make proper account, ok? 15:05 agaran well I look mostly at machines'n stuff..
16:23 sfan5 anyone here have windows device with touch? 16:24 agaran hmm if I manage to make tablet get past its bios (ie solder usb otg cable for keyboard) then I do..
16:24 red-001 windows devices with touch as in windows phones? 16:48 shangul why mt.rbose.org is down for me? 16:55 Out`Of`Control shangul: you get error on connect? 17:29 Krock fix superfluous shaders! 17:36 Fixer-laptop Krock: wanna compile smth for me? 17:43 Fixer-laptop Pentium M 2Ghz + 2GB should not be that slow? 17:54 Fixer-laptop Krock: size seems small... something missing? 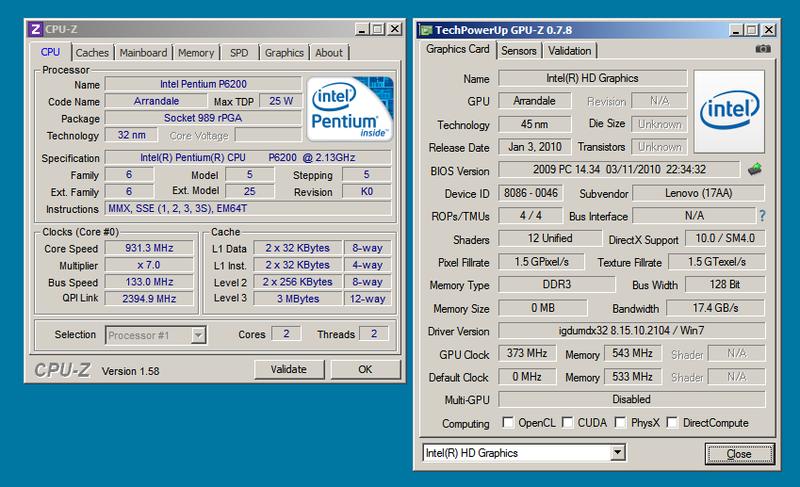 17:58 Calinou_ <Fixer-laptop> Pentium M 2Ghz + 2GB should not be that slow? 18:20 minetestusr i have text in the server names, etc..
18:22 twoelk maybe force language=en in the minetest.conf ? 18:25 twoelk what build did you use? 18:26 twoelk no, who compiled your minetest executable? 18:26 Krock does it also happen with a recent -dev build? 18:26 minetestusr didn't try dev builds, are there precompiled version of them ? 18:34 Fixer_ minetestusr: do you have github account? 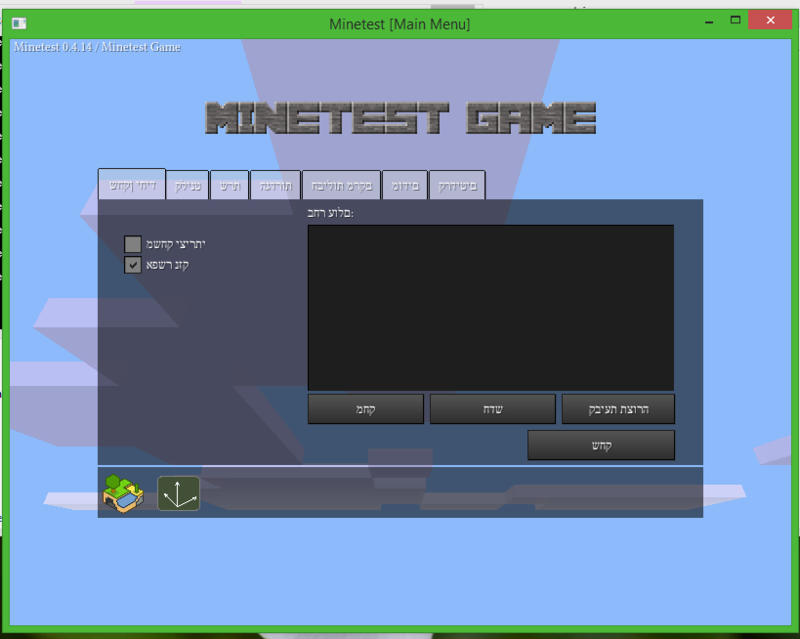 can you create an issue for minetest about hebrew problems? 18:39 minetestusr do other languages like arab work ok ? 18:40 Calinou_ I don't think RTL is supported in Irrlicht? 18:42 minetestusr if so, why put RTL locales ? 18:52 minetestusr btw, does minetest use iconv ? 19:04 minetestusr what is TLA ? 19:04 garywhite I tried to run MT in my VM and it says not a valid Win32 application, and I go "What?" then I realize "Wait, all my copies are x64"
19:14 est31 minetest is LGPL too, no? 19:31 minetestusr what about ICU's license ? 19:34 minetestusr i think you should still post an updated version which removes those RTL locales..
19:38 sfan5 who checks the checksums of the windows package? 19:38 sfan5 but the windows packages? 19:38 est31 build section in the forum? 19:40 twoelk still winter solistic? 19:43 sfan5 why not just rebase the last 245 commits? 19:52 redblade will 0.4.14.1 include changes up to now, like the protection against jungle tree griefing? 19:53 minetestusr ahh, so can you paste it there ? 19:56 red-001 isn't making a release as simple as making sure there are no new game breaking bugs and increasing the version number? 19:56 minetestusr why doe sthe ir cclient matter btw ? 19:56 red-001 or am I missing something? 19:57 red-001 would you have an ip address? 20:00 redblade garywhite: you run pixelshadow right? 20:06 redblade the vps provider likes to install libraries without all the other libraries they need to "save space"
20:14 Out`Of`Control can i read logs of dev channel? 20:19 redblade wait are you talking about ubuntu server? 20:22 BrandonReese No there's nothing wrong with it, it was just hard to try to use day to day. But you're right it would be better on a server than trying to use it as a desktop os. 20:29 minetestusr dont you know rickroll url by heart already ? 20:31 red-001 so I guess I avoided watching the greatest song of all time? 20:36 red-001 aren't tabs faster to write? 20:36 red-001 or do people bind tab to spaces??? 20:47 shadow Megaf: thanks for the info :) which server is yours? 21:14 nm0i "tabs vs spaces" vs "people that actually have to press any buttons for ident"
21:25 Megaf Hey nm0i. Hows it going? 21:26 nm0i Usual. Banned a lot of kids today. Just like yesterday. And the day before that. You? 21:26 Megaf shadow: if you happen to join the server and like it, then you can meet some of the players at #MegafServer. The server itself connects there. 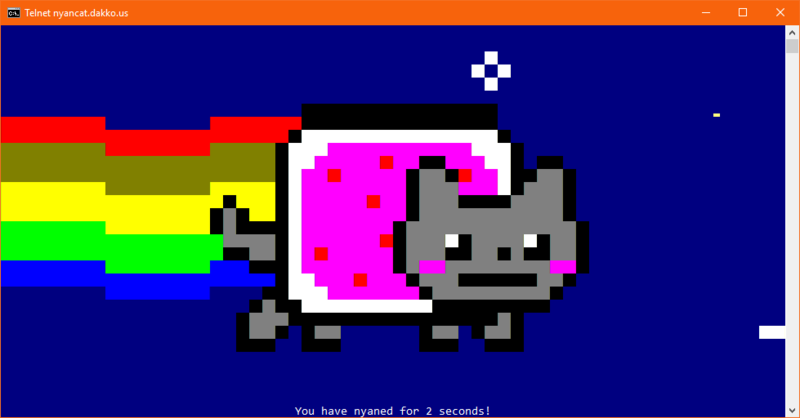 22:40 Megaf I remember when I saw that for the first time and my then first girlfriend was crazy about the nyan cat and pretty much everyone else on the internet and i was like, really? Common! 22:47 whitephoenix Anyone know why minetestserver --terminal complains about no name set in minetest.conf even though there is? 22:55 nm0i Yeah. I think I should disable it... Its mosltly used to build ugly floating platforms. 22:55 whitephoenix you guys think this warrants a bug report?